Hawa Mahal Palace of winds or Palace of the Breeze is one of the most famous tourist attraction in Jaipur city.The palace was constructed in 1799 by Maharaja Sawai Pratap Singh who belonged to Kachhwaha Rajput dynasty and Designed by Lal Chand Ustad. palace is in the form of crown 'krishna' the Hindu god. From the top it offers beautiful view of Jantar Mantar and city palace. This palace was built of red and pink sandstone. The main attraction of Hawa Mahal is its pyramid shape and its 953 windows or Jharokhas which are decorated with winding designs. its five storeys wall built so that the women of the royal family could observe life and processions of the city while unseen from the outside. These jharokhas were build in such a manner that air circulates naturally through them creating Venturi effect (doctor breeze) thus air conditioning the entire structure during the hot summers. The height of this pyramidal palace is 50 feet from its base. An imperial door from the city palace side leads to the entrance of the Hawa Mahal. It opens into a large courtyard, which has double storeyed buildings on three sides, with the Hawa Mahal enclosing it on the east side. An archaeological museum is also housed in this courtyard. in this museum there is miniature paintings and some rich antiques, such as ceremonial armour, which help stimulate the royal past. The interior of the Mahal consisting of chambers as also passages and pillars leading to the top storey is however quite plain and simple compared to the ornamented exterior. 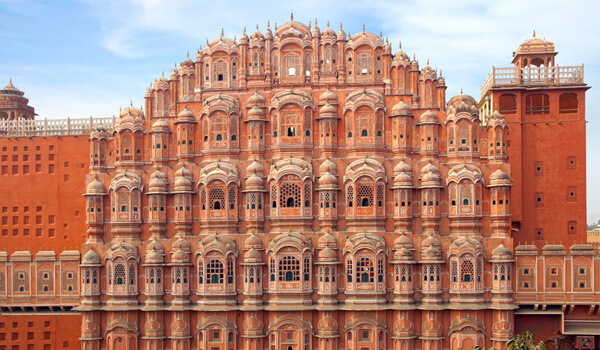 Jaipur city is very well connected by road, railway and air lines, So Hawa Mahal attracts national and international tourists. Jaipur International Airport at Sanganer, at a distance of 13 kilometres (8.1 mi) from the city.It can be visited on all days between 9:30 am to 4:30 pm. Best time to visit the hawa mahal in the morning when the sun rays fall on this building giving it a more gorgeous look. Jaipur Car Rental provides you a great opportunity to take Golden Triangle Tour packages, Rajasthan Tour Packages, same day tour packages with Luxury car rental services according to your affordable budget.